Proving that American journalists are either completely lost in their own bubble or have a better sense of humor than we would have imagined, the New York Press Club is awarding its annual “Truth to Power” award to CNN chief White House correspondent Jim Acosta. The award, which is intended to honor “an individual whose body of work challenges the power establishment and/or defends journalists,” will be presented to a man who has made a mockery of what it means to be a responsible, sober-minded reporter. More WWE villain than serious journalist, Acosta has spent the last two years engaging in stunt after stunt intended to spike the ratings and boost his own personal brand. He “challenges the power establishment” in approximately the same way as any bozo who hops over the White House fence. Unfortunately, we never get the privilege of seeing Acosta slammed to the ground by the Secret Service. Instead of taking his cue to sit down and shut up, Acosta began whining like a petulant child. “Some days we’ll have it, some days we won’t,” Spicer finally replied, exercising the exasperated patience of a kindergarten teacher. Acosta outdid even that performance in November of last year, when he managed to become the first reporter in our memory to actually have his credential stripped by the White House. Rude, arrogant, combative, and unwilling to give up the microphone during a Trump press conference (Acosta actually swatted away a female staffer who tried to wrest it from his grubby hands), the clown prince was berated by the president in front of a national audience. 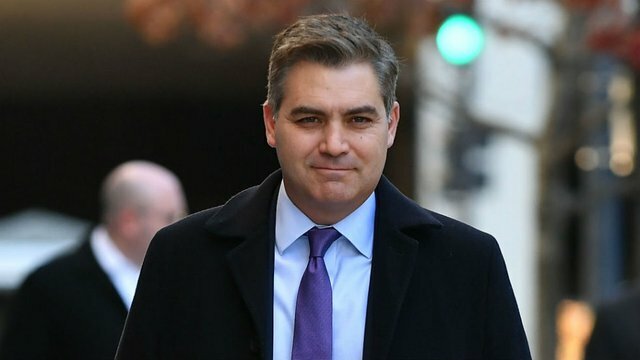 Acosta ultimately won a court judgment against the White House, allowing him to get his credentials back, but does this really strike anyone – even liberals – as the behavior of an upstanding journalist of the “utmost integrity?” Or does he just seem, in all ways, to be milking his moment in the spotlight for all that it’s worth? We guess the NY Press Club can’t see what’s plainly in front of their faces, but then again, that’s par for the course when it comes to the mainstream media.